Who were these masked miscreants? 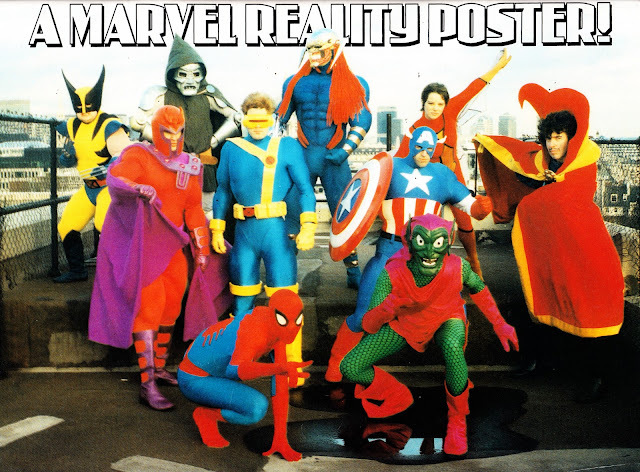 This motley assembly of masked Marvels appeared as a full page photo-poster in THE EXPLOITS OF SPIDER-MAN issue 18 (cover-dated 9 February 1994) and - presumably - shows the entire contents of Arundel House's dressing-up box. I assume it was taken on the roof of the Annex of Ideas, as previously seen in the Spider-man photo-strip that I posted way-back-when last year (here). For some reason my eye is particularly drawn to Wolverine. Marvel UK used these costumes for a number of personal appearances around this time. I posted a video of their appearance in the London Lord Mayor's Show here and I have some more scans, again from The Exploits of Spider-man, still to post. I immediately assumed these were Marvel UK staffers of the period but - equally - they could have been models hired for the day. Does anybody recognise anyone from this rouges gallery? Yes indeed, these bozos were all Marvel writers, editors and illustrators. We didn't have enough money to pay models! David Leach, Alan Cowsill, Tim Quinn, Stuart Bartlett, Bambos, Liam Sharp, Bryan Hitch, Christina McCormack, Jason Quinn.